Home » Blog » Astrid the Viking Wolf & the goats Pepper & Diablo! 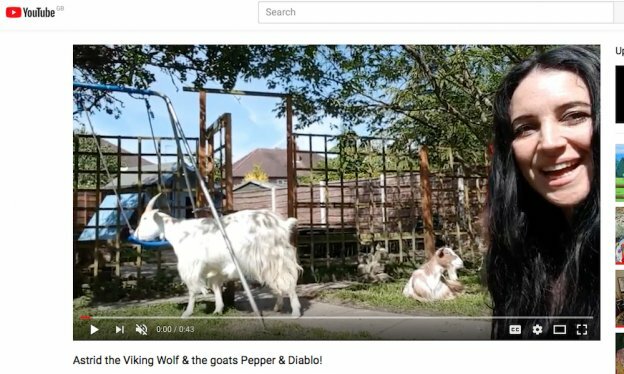 In the garden with Astrid the Viking Wolf & the goats Pepper & Diablo! Just a quick video to tell you about the term time classes i currently have available! So watch to find out more! A little bit about the animals now!! I’ve had goats for years! They are super ace pets! Very comical, affectionate & a bit crazy! I’ve had Pepper, the little brown one for many years, almost 13! I also used to have a his brother too, Pickles, but unfortunately he died when he was still young. So, I got Teddy, I rescued him from a farm, & he and Pepper where like brothers for about 12 years until Teddy died of cancer in the summer of 2016 . So, i rescued Diablo in the September of 2016 & boy he is a big strong devil! For about 25 years i was a cat lady! i rescued many cats over the years, but my last puss cat died last Autumn, Carrie, she was 20! So earlier this year i got my first dog! Astrid the Viking Wolf Chump! We rescued her from a shelter in Cyrpus! She is gorgeous! The best dog ever! & all 3 animals get along really well which is fab!! Parsley Pie Art Cub is a unique art retreat for children of all ages & abilities who want the time, space & resources to be truly creative! It’s so good for children to get off technology, screens & tablets & get stuck in & get messy! While tapping in to their own thoughts & ideas! We let kids use their own ideas & imaginations! There’s no set topics or expectations! Parsley Pie is all about FREEDOM!! YAY!! Super creative kids at Parsley Pie Art Club, Altrincham Art classes for children in Altrincham Cheshire! Book now!